In the meantime, we want to tell you more about the ways this venture connects with the recently published Library of Congress FY2019-2023 Strategic Plan and accompanying Digital Strategy. 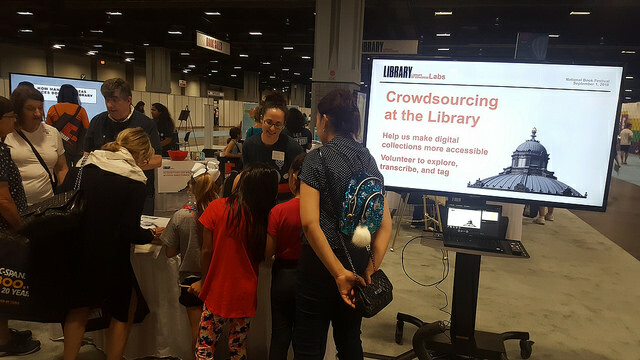 Earlier this month, the Library of Congress announced its new strategy, which emphasizes a user-centered, data-driven, and digitally enabled foundation to connect with all Americans. This strategy is supported and extended by the premiere of the Digital Strategy, which underscores the goals of opening our treasures to the world for use and exploration, inspiring deeper connections with people where they are, and investing in our future. The new crowdsourcing program exemplifies the strategic plan and the charge of the Digital Strategy. Specifically, it was developed with user-centered design principles that emphasize cultivating trust and approachability as a complement to the authoritative role the Library of Congress plays in American memory. It is data-driven and carefully designed in dialogue with the key takeaways of previous Library of Congress participatory projects. Broadly speaking, these takeaways include: 1) we benefit from an enthusiastic public who are hungry for knowledge, 2) these projects require responsible resourcing for committed staff and software development support, 3) these projects are not complete until crowd-generated information is returned to source objects, 4) workflows must suit the source materials, and 5) the Library of Congress operates at scale and our program must consider this reality. These lessons learned point to our responsibility to engage, understand, connect and create space to grow with the people who join us in this program. Part of our promise to the public has been to develop in the open from the start of the project. In the coming weeks, we’ll have a more focused view of the agile software development process and the ways we’ve been developing the transcription and tagging tool Concordia. We’re sharing the GitHub repository with you now while we get the final touches on the launch version of the application. If you’re interested in adopting Concordia, reach out to crowd@loc.gov or make an issue in GitHub. We’d love to learn about your project! We’re learning from the great work of colleagues at the U.S. National Archives and Records Administration and the Smithsonian Transcription Center, as well as peers across the crowdsourcing domain including Zooniverse, New York Public Library, British Library, and Omeka Scripto-based projects. Over time, we’ve learned that people who contribute to these projects pursue personal learning objectives and want to contribute to larger goals, while being challenged along the way. In tandem with the strategic moves described above, the Library of Congress Labs team has joined the Digital Strategy Office, which is led by the Director of Digital Strategy Kate Zwaard. You can still find us at https://labs.loc.gov!. Our work remains focused on connecting people with our collections and we have expanded our scope to support the Digital Strategy through ongoing experimentation and evaluating impact. We continue to center people, focus on reducing barriers in process and inclusion, and learn from our colleagues in the Library of Congress and peers elsewhere tackling similar challenges. We’re delighted to introduce you to three new staff members who are leading this effort: Lauren Algee, Elaine Kamlley, and Victoria Van Hyning. Together, they form a team of Community Managers and will steward interconnected pieces of the crowdsourcing practice from embedded positions across the Library of Congress focusing on engagement, collections, and software development. Lauren Algee was previously Digital Curation Librarian at DC Public Library where she managed the digital collections lifecycle for Special Collections and served as Project Supervisor for the Memory Lab Network. As a Community Manager focused on user engagement and outreach, she brings experience in community-focused digital library and archive projects and an interest in expanding access and services for non-traditional audiences. Lauren will be embedded in the Library of Congress Labs team. Victoria Van Hyning comes to us from another crowdsourcing platform, Zooniverse.org, where she led the development of humanities projects and research. She holds a PhD in English literature and has worked extensively with archival collections for her research. Victoria has written articles and a book on the subjects of convents and autobiography, as well as articles about crowdsourcing. She reports that she’s glad to be here at the Library, marrying up these two branches of her research and professional experience. Victoria will support Library staff and create process to identify collections that will benefit from transcription within our Library Services Directorate. Elaine Kamlley will be the technical project manager and guide the open source development for the Concordia platform while embedded in the Platform Services Division of the Office of the Chief Information Officer. Elaine comes from 18F, a unit in the General Services Administration that partners with government agencies to improve public-facing technical services while streamlining procurement for shared tools like cloud.gov. They also served with StoryCorps as Recording Operations Manager on the Recording and Archives team. A central component of Elaine’s work has been aligning our team and colleagues through development. You can explore the progress of the project in a number of other ways. Sign up for the crowdsourcing eNewsletter. We’ll share more about the program, tool, and ways to engage soon and you can expect updates from Lauren, Victoria, and Elaine as we roll out new features and functionality. Leave us a question below or sign up for the LC Labs Listserv - you can also follow us on Twitter as we share details of the launch next week! This is a syndicated post. Read the original at The Signal 2018-10-17.